It's a rare moment when adults feel secure enough to be seen, in public, reading a book with a wizard on the cover. But there's safety in numbers. You-Know-Who and the Deathly Hallows is inescapable -- its buttercup-yellow jacket and cinderblock dimensions clearly visible through bus windows, on bar tables, and propped up next to giant bowls of pho in Vietnamese restaurants. When one isn't (barely) resisting the temptation to fling open doors, yell "Climactic battle! Robots vs. underwater unicorns!" or "Voldemort! Hagrid! En flagrante! Hot oil massage!" and then tear off down the street, one thinks dolefully of days to come, when (once again) dragons are passé, and anything with wands or magical companion animals is tucked securely between the pages of Swann's Way when venturing out among strangers. It's interesting to note that in Great Britain, the Deathly Hallows comes in two paper disguises: The "children's edition" (regrettably hectic rosy-cheeked illustrations) and the "adult edition" which is done up in Masterpiece Theater drag, but it is hard to believe fools anyone. Why do we have no such beards for Harry Potter novels in America? We, who have at least five varieties of ipod, not to mention eight million varieties of sugared puffed corn product, have only one kind of Harry Potter? Shameful. We should have a McSweeney's Harry Potter, each sentence sealed in a tiny individually stamped and numbered envelope, plus depressing illustrations by Chris Ware. We deserve a John Grisham Harry Potter with big raised lettering, and a nice gavel on the front cover. And what of a Flowers in the Attic Harry Potter with die-cut cover and spooky children? Bodice ripper Harry Potter? Treatise-on-Global-Warming Harry Potter? We could do the Brits one better and smuggle countless underappreciated children's wizard novels into mainstream society. Or at least into fresh new ghettos. It's quite possible that the sheer awfulness of this book's original American cover prevented it from ever catching on here in quite the way that it should have. This particular redesign is clearly not intended to attract an older group of readers, and to conjure up innocuous memories of Arthur Rackham, Brueghel, and all things European and covered in varnish. The iridescent fangy thing in the corner is a major figure in the story (the observant will note it is displayed prominently on the earlier cover as well) but it's a bit too trippy and "bad experience on Robutussin" -- especially in combination with the corpse-like scarecrow. How to better disguise this book, and send it out into the world in the possession of persons otherwise too timid to read it? A shamless rip-off of Haruki Murakami is best in this case -- the book was, after all, adapted (if rather loosely) into a film by Hayao Miyazaki, and this way all the art school students who still have all of the Andrew Lang Fairy Books stashed away back at their parents house can carry this around in their capacious tote bags with ironic messages on them. The first edition of this book, with its attacking three-headed dragons, battleaxes, and exposed knees, makes us realize just how much fantasy novels have toned down their act since 1983, when the first edition was published. The '87 edition, while clearly aiming for a wider audience (or maybe just one that's more into chiaroscuro than knees) comes off as more grownup, but a lot less exciting -- it's striving for a grandeur that its predecessor, with its characters who look like they're being attacked by an offstage wind machine, gleefully misses. The best -- oh hell, let's say "only" -- way to properly disguise this wizard novel is to go counter-intuitive and turn the cheese factor back up. Think nouveau pulp. No one will ever suspect that it actually does have battleaxes, and characters with names like Rolfr and Hross-Bjorn. You know, even Caldecott Medal-winning illustrators have their off days. This particular cover, depicting what appears to be a very young Andy Warhol being swallowed by an enormous fanged quilt, is a case in point. J.K. Rowling has been occasionally accused of poaching a few plot points from this book, but the Venn diagram of books about boarding schools and books about wizards has intersected many times before (and likely will again, especially now that potential profit has been so clearly illustrated. Until Ms. Rowling's successes, not many people set out to write books about characters who lived in castles, while simultaneously plotting out the future floor plan of the castle that they would build with their staggering royalties). At any rate, great teeth on the quilt, nice castle in the background, excellent butterfly collar on the kid, but a rather disappointing everything else. And I'm a little distressed at all of the miserable-looking human faces inside the quilt's individual patches. Is this some kind of evil devil quilt? Is this book going to convert my children to Satanism? Is that why that little boy looks so anemic? Satan? Perhaps this book could do with being tucked inside a book like this one as a way to fend off the wizard-suspicious and the devil-skittish.. The lack of question mark on the end of the title worries me in all sorts of ways, but check out how gracefully the dragon's neck mirrors the stone archway. And just look at the spittle on that dragon. That's some fine spittle. Masterful, even. We have arrived at the rarest example of wizard-based lit -- that with the classy, masterfully executed illustration. It seems a shame to suggest that it be disguised as a copy of The South Beach Diet or The Oxford Companion to Economics in India. For those who love stories about small children who run afoul of dragons, and yet are ashamed to admit so publicly, we suggest hiding this book under your pillow, next to your collection of small handguns. The current cover is simply too pleasant to contemplate altering. There's something about Ms. Le Guin that results in frequent cover redesigns, and it's illuminating to see all the changes that the first book in the Earthsea series has gone through, from 1960s avocado slime mold to beefcake to fairytale castle to fairytale castle to fairytale castle to what appears to be its most recent incarnation: a gold-lettered, Myst-inspired Photoshoppy landscape complete with jagged cliffs, overly textured water, and lens flare. What could have brought this on? The success of the Lord of the Rings films, and the consequent assumption that all fantasy novels must now appear to take place in places that look remarkably like New Zealand? 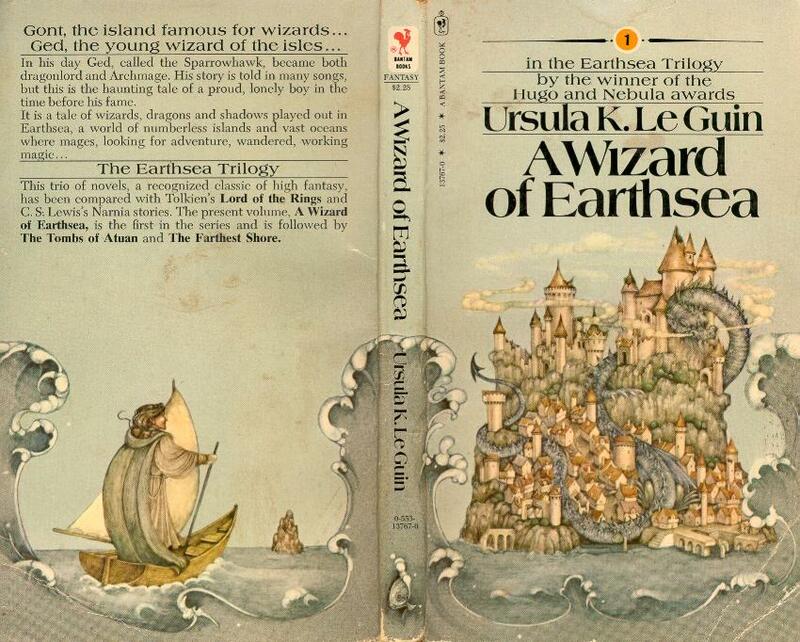 A Wizard of Earthsea is clearly the Madonna of the wizard genre. It cycles along, and does not need our assistance in its reinvention. Though I personally would like to see it disguised as a Louis L'Amour novel. Make it so.